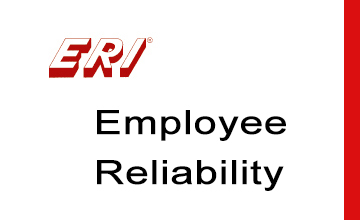 The Employee Reliability (ERI) is a criterion-keyed, self-administered, “True – False” type of behavior inventory. It contains 81 statements. Results for each scale are presented in an easy to understand format designed to add flexibility to your selection process. Results provide an estimate of the likelihood that a job applicant will perform, on the job, in a reliable and productive manner. The ERI® consists of seven (7) separate scales. Each scale assesses job applicants with respect to a different dimension of reliable and productive behavior. The ERI is a risk management tool that helps you determine which individuals are most likely to become valued employees rather than organizational liabilities. The ERI will determine whether a candidate is low-risk or high-risk based on seven different scales. The ERI results are designed to assist you in reducing: Turnover, Absenteeism, Work-related accidents, and Theft. Because it was validated as a pre-employment questionnaire, the ERI® should not be used to evaluate current employees or for any purpose other than as an aid in the pre-employment selection process.